I don’t know about the rest of you, but January came ferociously roaring into our neck of the woods, last week! Our temperatures dipped into the low 20’s for several nights in a row and, on January 3, over three inches of snow fell in our yard! The snow’s all gone (as of Monday) and our temperatures are nearing 70 again. Life is getting back to normal here in the deep south. Speaking of normal, it’s Wednesday and that means it’s time for The Hodgepodge! As always, thanks to Joyce for hosting this fun, mid-week distraction. I don’t think I’ve ever had an actual mentor. I guess you could say I mentored a few insecure first graders through some rough times, during my years of working as a paraprofessional. And once, I briefly mentored another paraprofessional. I found the experiences gratifying. It’s always good to help someone. 3. I saw a cartoon on facebook highlighting a few ‘weird’ things that make you happy as an adult. The list included-writing with a nice pen, having plans cancelled, freshly cleaned sheets, eating the corner brownie, cleaning the dryer lint screen, and sipping coffee in that brief time before anyone else wakes up. (Credit for the cartoon goes here) Of the ‘weird’ things listed which one makes you happiest? What is one more ‘weird’ thing you’d add to the list? The only thing on the list that makes me happy is freshly cleaned sheets. I love clean sheets! If I could add something to the list, I’d say “soaking in the bathtub.” By the way, I HATE cleaning the dryer lint screen! 4. What’s the last good thing you ate? 5. Describe life in your 20’s in one sentence. Life in my 20’s was filled with changes, challenges, and lots of happiness, (and I wouldn’t change a minute of it)! Random: I’d like to write more about the rare and beautiful snow we experienced, last week, but I’ll save it for a future post. I will share one picture, though. I think our Christmas decorations were quite appropriate for the snowy setting, don’t you? The last time we saw this much snow was in 1989! My favorite kind of soup is homemade vegetable beef soup, served with hot cornbread! I especially enjoy making it with home-grown vegetables–and I just made some a few days ago! 2. When was the last time you saw snow? Sadly, we don’t get snow here in the south very often. The last time we had enough snow to stay on the ground was in February of 2010. It didn’t begin snowing until after dark, and most of it melted by noon the following day. 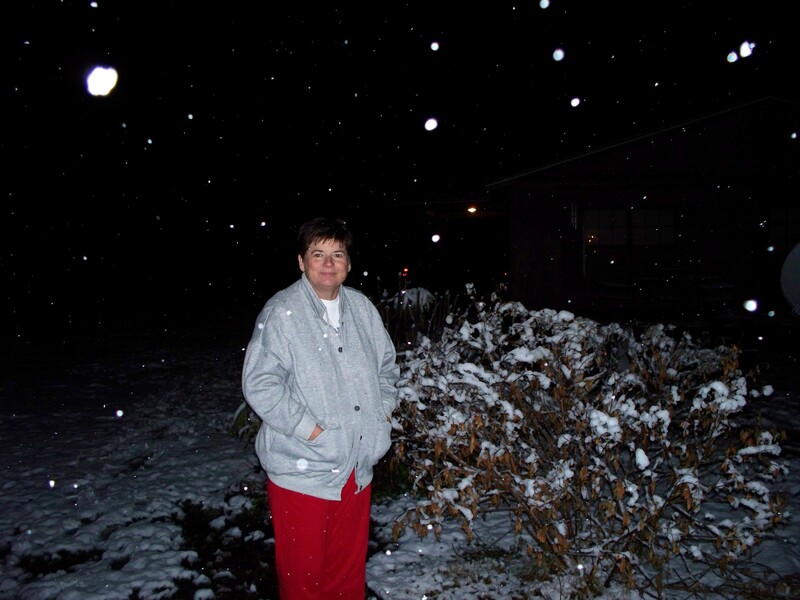 As a result, most our snow activities, and the photographs of them, took place at night! 3. What is a must have trait if someone is going to live with you? 4. Who was your favorite James Bond? I’ve never been a fan of James Bond movies, but I do like Pierce Brosnan! 5. Who cooks the turkey for your family’s Thanksgiving dinner? With the exception of a couple of years, the turkey task has been my responsibility for somewhere around twenty years. It was a very busy weekend at our house, so I am beginning the week tired. I won’t take time to tell you the details, but I will tell you that our weekend involved traveling out of town to get a new laptop, looking at someone’s new house, eating out, doing some grocery shopping, and hosting a birthday dinner! No wonder I’m tired today! There are a lot of things I want to document here, but today I have to clean up a bit, and get ready for visitors. Our two little grandsons are coming for a visit while their mama goes to an out-of-town appointment. I’ll be back tomorrow! It had been over twenty years since we had seen any snow in our area. Our last snowfall was in December of 1989–just a couple of days before Christmas! Our children were ages 11, 7, and 4 that year. 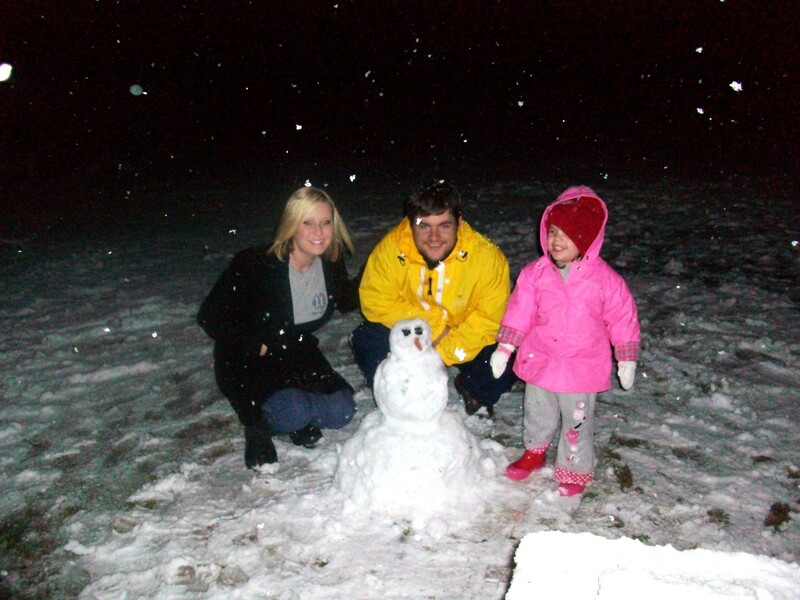 Of course, we went outside and played in the snow, made a snowman, and took a few pictures. The years passed, and most of those snow memories faded from the minds of our children. Our weatherman predicted snow a couple of times this winter, but nothing ever came of it….so when they began predicting snow for a third time, I really didn’t pay them much attention. Friday, February 12, people were bustling with excitement. Our schools closed early and everyone was in anticipation of the impending snowfall. I didn’t have to go anywhere, so I just went on with my daily routine. I wasn’t sure if we’d see snow or not. 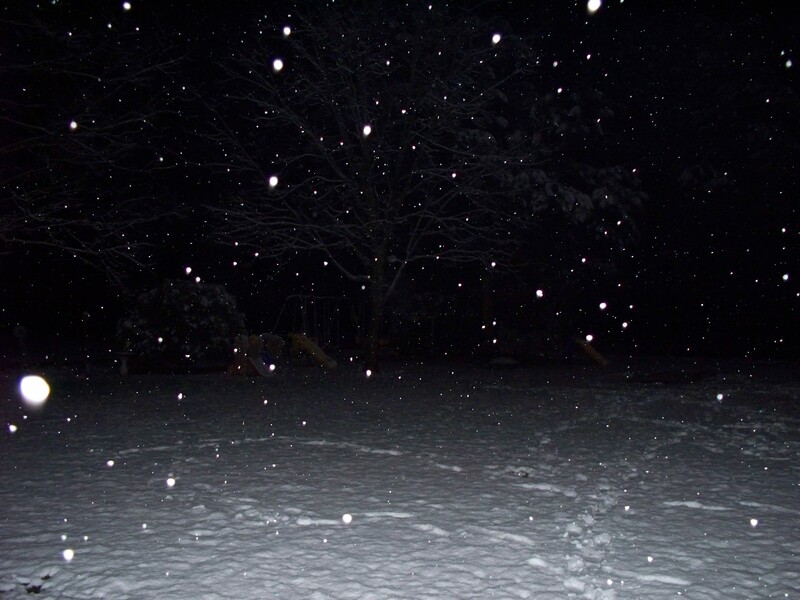 Finally, shortly after dark, the snowflakes began to fall where we live! We’d been watching the news and weather, and knew that snow was finally headed our way. We’d hoped that it would arrive during daylight hours, but that was not the case. As we looked outside our back door into the darkness, it looked like a blizzard–or what I imagine a blizzard would look like. The flakes were very large, and very thick. Within two hours, the ground was covered with about two to three inches of white, powdery snow. All three of our now-grown children showed up at our house to celebrate the snowfall, and go outside to play in it. 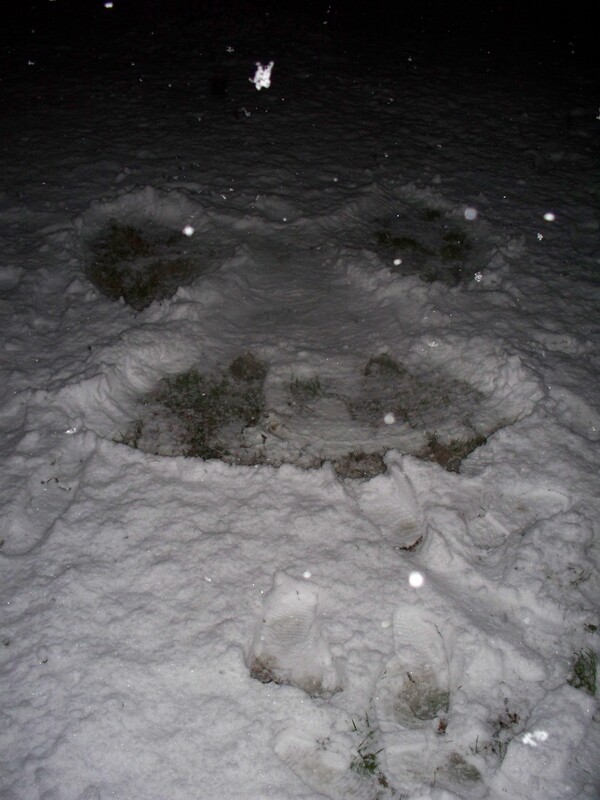 They made a snowman, there were snowball fights, and our youngest son even made his first snow angel. I watched from the warmth and safety of indoors, as our grown children played in the snow, lighted by the light beaming from the side porch light. I couldn’t get over their excitement, then I realized that it was the first snowfall that they really remembered. If it had been daytime, I would’ve been outside in the middle of the activity, but since it was dark, and the surfaces were icy and slippery, I hesitated to go outside. I was afraid I’d fall. Finally, after everyone had their fill of playing in the snow–and running in and out–I ventured out into the dark night to view the snow. By then it had almost stopped snowing, and the snow was beginning to melt because of the warmth of the ground. What I could see was beautiful. I took a few pictures in total darkness, and carefully slipped back into the warmth of the house. I didn’t even make a snowball! I heard on the news that it actually snowed in 49 out of 50 states on February 12. That probably will never happen again…not in my lifetime anyway. I do hope that it doesn’t wait twenty years before it decides to snow in Georgia again…I’d like to be around to see at least one more snowfall!